GITAM University Placements: GITAM University, Vishakhapatnam has a Training and Placement cell, Which is headed by a senior faculty and assisted by assistant officers and student coordinators. The main objective of GITAM University is to achieve 100% placement, by providing training in personality development, and employable skills. Innovative entrepreneurs and Leaders are also developed by the GITAM University. 1)internship may be paid, unpaid or partially paid (in the form of a stipend).frankly no. 2)yes.eg-amazon,Asian paints, Flipkart etc. 3) around 3.5-4 lakhs.Highest package is 16 lakhs in microsoft.75 percentage of batch which get placed 4)our allumini which is spread world wide in various sector both technical and management tires of rapid changing world includes IAS , IIM, CEO, Stanford University etc, in countries like usa, Australia,United kingdom. I have done my internship on web development which can be a plus during campus interviews Companies such as Microsoft, TCS, Delloite(there are few more good companies)hire you for the programmer, Software engineer, developer, and consultant. The average salary is around INR 3.6 lakh rupees per annum.Highest is around INR 9.6 lakh per annum that Microsoft paid for. A total of 65% got placed excluding the ones who wanted to go for higher education and persons who still have not cleared some exams. Alumni is updated Every time unless you are too bored to update yourself on Google sheet which was shared by the alumni head. I am just from 1st year so have not done any internships BUT, I have made sure that I attend as many workshops that I can attend . Many companies recruit GITAMITES every year. as of my knowledge TCS , VERIZON, AMAZON, WIPRO etc come every year to recriut in GITAM. I remember that one among the highest package is Rs 18 lakhs per annum . Alumni network is very good. Many former students of GITAM are in great positions. AVEVA (Profile Type: Core) Designation: Gradate Engineer Trainee Annual Salary: 3.5 Lacs per Annum; Eligible Branches: CSE, IT; CGPA Cutoff: 6; No of students placed: 6 (5-CSE, 1-Mechanical). The list above are the companies at GITAM University. The average salary is from INR 3.5 lakhs to 7 lakhs per annum. Many companies come for the recruitment. I have done my internship at Girijan Cooperation, Visakhapatnam. The average salary would be around INR 4 lakhs and the highest salary is 7 lakhs per annum, 98% students got placed last year. GITAM Institute of Management (GIM) enjoys a healthy relationship with its recruiting partners through its strong emphasis on industry-academic interface. This gives us at GIM, an edge over our competitor in regard to attract quality recruiters hiring our students year after year. A 100% placement record has been achieved for the batch of 2014-16. Approximately 40 recruiters visited the campus recruiting the students of GIM. In terms of number of offers, Tata Teleservices Ltd was the top recruiter across all clusters having picked 8 students from the campus, followed by TCS hiring 7 students. Companies from all sectors hired candidates for a wide range of functions, prominent among them being Financial Services, IT, FMCG, Retail, Pharma, etc. This year saw a large number of students entering into the financial services sector with 40% of the placements being in this area. Some of the prominent recruiters in this sector are HDFC Asset Management Fund, Deloitte, Air Worldwide (Verisk Analytics Business), Invesco, L&T Financial Services, ICICI Securities. A large number of students took up roles in Sales & Marketing in various companies such as ITC, Wrigley India Ltd, Tata Teleservices, Telenor, InforEdge-Naukri.com, etc. Majority of the students have been recruited in the salary bracket ranging between Rs. 400,000 and Rs. 500,000, with the highest package offered being Rs. 750,000 and the average CTC being Rs. 500,000 It is interesting to note that many of the recruiters have made it a point to re-visit the campus every year for their recruitment needs, which is a sign of their satisfaction with GIM students. GIM encourages students to take up entrepreneurship and this year, thirteen students opted to start their own ventures, or be part of their family business. First time recruiters who visited the campus this year include TCS, Cisil, Hyderabad Industries Ltd., L&T Financial Services, Universal Sompo General Insurance Company. INTERNSHIPS IS THERE FROM 3RD YEAR ONWARDS AT GITAM University, Vishakhapatnam. COMPANIES LIKE DR.REDDYS, NESTLES, MARK, OTHERS VISIT FOR PLACEMENTS. THE AVERAGE SALARY IS Rs. 20,000 PER MONTH. I have not done any internship or job in any companies yet and I am still studying 3rd year of B.pharmacy. I have done my internship at Hindustan petroleum corporation limited There are many companies like tata, Deloitte, google, amazon etc. The average salary is INR 2.5 lakh per anum Its the best. There is a website called gitam alumini network for it. The campus placements are like high companies like (Tech Mahindra,icici,hdfc,sbi,idea,Deloitte). I've interned at two places, and at both places, I had a stipend of INR 6000 per month. Google, Delloite, TCSs and some of the companies that hire from campus. Avg salary is INR 3 lakhs per year. Highest salary is INR 8 lakhs per year. More than 50% of students get placed. The alumni network has been going strong for over 60 years. Average placements. Companies like Zaro, valenta bpo solutions, amazon etc.. come for camous placements. Internships are provided by this college with the good stipend. Placements are good at this college. Companies like Deloitte, Airtel, ITC, Wrigley, ICICI, and Amazon etc come for the placements with the average salary package of INR 12 lakhs per annum. Campus placement is pretty much good companies like Microsoft and Google even came for the campus placement and altogether 85% people get placed. The alumni association is nice. Placements are good at this college with the average salary package. I attend for campus interview to Wipro company as a Junior Accountant, it was good. 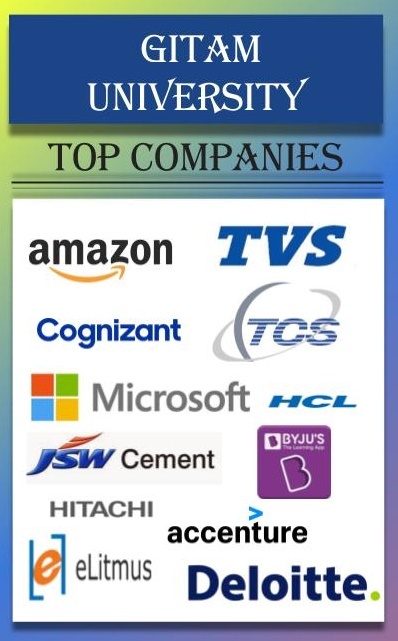 key companies that come for campus interview are TCS, ACCENTURE, MICROSOFT, AMAZON, etc. INR 3.5 lakhs to 6.8 lakhs per annum is the average salary. The internship is ok but placements are less at GITAM.